I love ziplining! Stoney Creek out of Seward, AK gives you your money's worth with a full afternoon of zipping, rappelling, and walking on swaying rope and board bridges. Not only is it exciting, the group leaders are personable and fun. There's nothing like being on top of the world: Amazing accomplishment. No air. Incredible views. The itch to do "just one more." This site has everything you want to know about climbing Colorado's 53 mountain summits that are above 14,000 feet. I've climbed two: Gray's and Mt. Sherman. My son has climbed all 53 --- at least once, if not more. 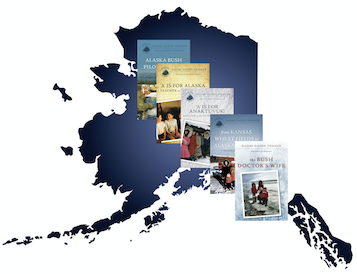 Paul Gray, independent TV producer and founder of "Exploring Alaska", is determined to show-and-tell millions of viewers the many wonders of Alaska's people, culture, scenery, and history. His DVDs take you from tundra to mountains, oceans, villages and towns...from art to wildlife...from visitor attractions to industry. He's terrific to work with and interviewed me for 'Homesteading Doctors' which features early healthcare on the Central Peninsula, where my father was one of the first physicians. That DVD is available from my website or his - and something every person interested in rural and wilderness medicine should watch. I never tire of visiting this museum, which is both indoors and out. In July there is typically a Salmon Bake and Fly-in. What a thrill to watch the vintage aircraft fly off and on Lake Hood! If you're in Anchorage, don't miss this destination. The News-Miner provides me with news from the Interior, which is my favorite part of Alaska. I visit Fairbanks nearly once a year to see my sister, explore, catch small planes to villages in the bush, and enjoy what Fairbanks has to offer in sightseeing.